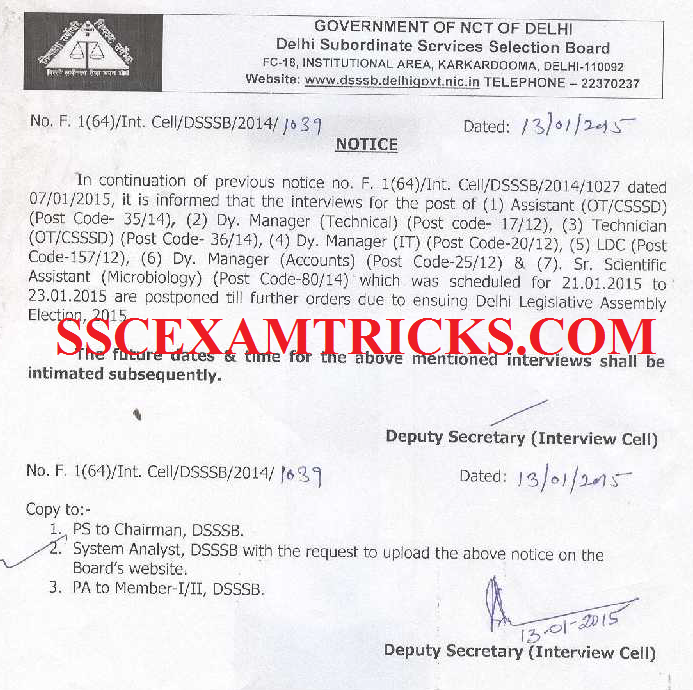 As per recent notice released by DSSSB about postponed interview schedule which was scheduled for 21st and 23rd January 2015 for the posts of Lower Division Clerk, Technician, Assistants and Dynamic Manager (Technical/IT/Account) against post code 35/14, 36/14, 17/12, 20/12, 57/12, 25/12, 80/14. This interview schedule was postponed due to Delhi Legislative Election 2015. The interview will be rescheduled till further notice to be released on the official website. Those candidates who were going to appear in the interview can get their interview call letter from this direct link whenever it gets released on the official website. The selection will be done on the basis of performance of candidates in written test along with interview. First Stage was written test and Second test will be interview which will be conducted by DSSSB. Candidates can download their interview letter from the direct link provided in the end of the posts whenever it gets released by DSSSB. Take a print out of computer generated interview letter and affix coloured photograph in the prescribed size. Note down the date, time and venue of interview and reach there at least 30 minutes from the time mentioned in the interview letter. The interview schedule will be mentioned on the interview letter of the candidate. The candidates must bring their interview call letter to the venue of interview. No candidate will be interviewed with Interview call letter. Read all the instruction provided in the interview letter and follow these instructions during interview time. No TA DA will be paid to the candidate to attend the interview. Candidate will have to bear the expenditure of to and fro to attend interview.